I wrote this letter shortly before my son started preschool in the fall of 2013. Like any parent, I was naturally nervous about him starting school and being away from me for the first time in his life. Considering I’m a helicopter special needs parent, I was a wreck. Congratulations! You have the pleasure of teaching my amazingly awesome, super adorable, and absolutely amazing child. I’m sure you’ve heard a lot about him, as he is a pretty popular fellow. His first week of school will be hell, for all involved, due to all the big changes. Don’t let this deter you. Don’t be afraid of him. He’s actually freakishly well behaved and a pretty mellow guy once he gets in to a routine. His father and I are also great resources to help you teach our child, so please utilize us as much as you absolutely need to, as in the end we both want the same things…for Spencer to be the best Spencer he can be and for him to love school. I’m sure you’ve read his IEP and his lengthy list of diagnoses. The thing to remember about Say Barber Biesecker Syndrome, or Genitopatellar Syndrome, or any of the other thirty of so diagnoses Spencer has is that they do not define who he is. Spencer is well behaved, brave, a talented musician (although I’m a little biased), funny, compassionate, and a great big brother whether he wants to admit it or not. He, however, is not hypotonia, autism, or his intellectual delay. Sometimes it’s easy to forget that he’s three and a half and not a baby. Please don’t treat him like one, because the second you do, he will eat you alive. He knows how to play the game of letting people underestimate him. Make him do things he doesn’t want to do. He’ll cry a bit. He’ll either get over it or have a complete and utter meltdown, but at least he tried it and we can try it again or adapt for the next time. The only way he will grow is if we challenge him. My biggest fear with Spencer starting school is the other children. There are safety concerns, naturally, but I am more concerned about how he may be treated. Don’t let Spencer isolate himself. He’ll try to. He isn’t a huge fan of other children and will often cry when they approach him. My biggest hope for school is that he will get over that and make some friends, and if he is sheltered from them he won’t. Kids don’t judge at this age, and will hopefully see a buddy, not a wheelchair, walker, or feeding tube. Love him. He’s easy to love. Remember this little boy is my heart. I have fought too long and too hard for him for someone to break my heart. Be patient, be kind. In return, he will give you gifts. He will show you beauty and truth in a world that sometimes can be ugly. He will show you that sometimes even the smallest achievements are often the greatest accomplishments. By loving him, he will love you and you’ll gain more than you ever imagined. My biggest piece of advice? Don’t panic. I have kept this child alive for three and a half years with no formal medical training (I actually have an education degree). You’ll be fine. 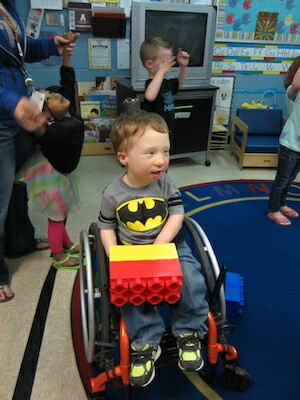 By the way, he did awesome at preschool and absolutely loved it. School brought him out of his shell and helped him grow in ways we never imagined. He loved his teachers and new friends, and they loved him in return. While I am still nervous, I’m very excited for him to start kindergarten this fall! Rachel and Spencer Nichols live in Ashland, KY. You can follow their journey on their blog, Joining the Clubbed Foot Club: And Other Spencer Related Adventures.